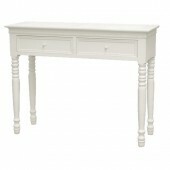 Shabby Chic dressing table with two drawers, in a distressed white painted finish with turned legs. 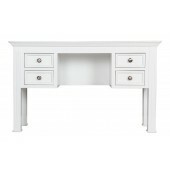 Ideally suited to use with our Belgravia Chic Dressing Table Mirror and Belgravia Chic Dressing Table Stool. 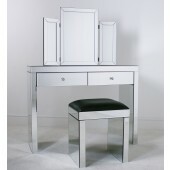 Mirrored 2 Drawer Dressing Table in a contemporary style. 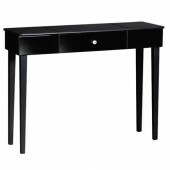 Style is a statement, and this Black Glass Dressing Table oozes style wherever it is placed in your home. The stunning and versatile design of this glass dressing table means it can sit comfortably with any interior design whether contemporary or traditional. Sheer strength of character in the piece is portrayed from the strong clean lines, bevelled glass edging throughout, even down to the finishing touches with a crystal style handle on the drawer. Not only is it versatile in whatever interior decor it can be placed but also which rooms, ranging from a dressing table in your bedroom to a console table in your hallway. This black glass table could blend in anywhere. A great mix of practicality, quality and style will transform you living space. 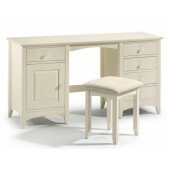 This vanity dressing table is painted with a three-layer satin white finish that is easy to clean, and gives a neutral styling perfect for any decor. 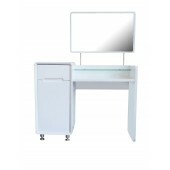 Comes with 4 drawers, 2 down each side, to store all your make-up and jewelry away from view. Decorated with pewter silver colour handles, creating a traditional and simple silhouette. 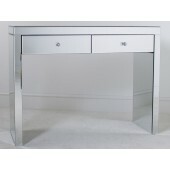 i) Mirrored Dressing Table - With two drawers and glass handles and soft glide metal runners for the 2 drawers. ii) Mirrored Stool - Contemporary style mirrored stool with black seat pad. The Chateau French style console table is a high quality reproduction of authentic French antique furniture designed to add beauty your hallway. Showing off intricate carved detailing and curved legs with an antique white painted finish and very slight shabby chic ditsressing, with contrasting darker brass drop handles to encapsulate every detail of French chic. 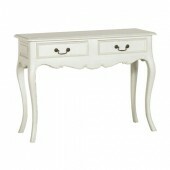 High quality workmanship and made from solid mahogany gives this piece timeless style.